Love the Rain and Awkward Moments! The rain keeps on pouring these days and it's really hard for commuters like me to go home after a heavy downpour. But what's soulfully gratifying is the chilly temperature inside the bus and the rich melancholic feeling I get from a short retrospection. 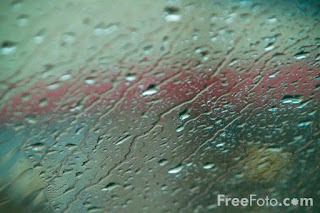 Seeing the raindrops on the bus' window reminds me of the good ol days. And I continue my contemplation on what transpired within the day or just think of plain old memories while walking and skipping puddles after I get off the bus. Like last night, I suddenly thought of this one awkward moment that I can still vividly recall and replay in my memory (and even rewind, mind you). It was Thursday then. I went down the LRT and hopped my way to South Gate. It was a happy day because my thesismates and I were already sure of defending our obra. So there I was, all smiles and feeling on top of the world. I was behind this girl in her emo/punk/rockista fashion statement. You know, the usual, black tee-skinny jeans-black chucks-thick black eyeliner-kind-of-thing. I was a bit irritated because one, she was walking sooo slow, and second, she was talking on the phone in super pa-cute tone "Baby, Im here na, See you." I let go of the moment and when we got in, boy, what a surprise. The emo-punk-rocker girl kissed and hugged that guy who was then part of my org and who once upon a time kept texting me and making pa cute, but because of I dont know what incident occurred, he never ever talked or looked at me straight in the eye again . Of course, I have to pass by them and the really strange and awkward thing was, the jerk was looking at me sternly as if saying "BWAHAHA. SHE'S MY GIRL. I HAVE A GIRLFRIEND" Yeah right. I was laughing so hard and went straight to our org's office to spread the news, to say the least. Oh, how people become so desperate. My three year-old kikay phone gave up on me after a hundred and one falls. It did serve me well. Im gonna miss the phone where I took my only solo picture with Sir Doy. Mom replaced it with a pink nokia phone though, the express music slide phone. It's pretty, but my samsung's prettier. I promise to stay home this Sunday and Monday. By the way, our new mktg manager is lalalove :) She looks really cool!